Some of the highlighted areas are Google changes and the user discovery experience. One example of what has changed is the appearance of neural matching. For example, 30% of all queries use neural matching. Moreover, Google is developing into discovery engine, where the main focus is on discovery than search. This is literally true in the case of the Google feed. Another significant change is the inclusion of the topic layer. Google increased understanding of entities, and that makes possible for Google to improve exploring the content that is most important to the user’s query, which means their actual needs. This is not an abuse of links, but an improved methodology for determining relevance. SEOs tend to optimize for search, not discovery, where the entity holds a lot of the value. Considering this, there is a need to start thinking about other ways to approach optimization. Use your technical expertise to estimate your focus. Basically, the main point (answer the question) needs to be in the first four lines of the content. Elaborate upon that with examples, and then comment on that. This is important if you want to succeed in today’s world. However, it doesn’t imply that you must be the best at everything, but secure your space and then make it yours. This starts by knowing where the user is on their journey when they get to your site. What do they need at the moment when they arrive on your web page? Understand all the possible situations that took the visitors to your page, and then come up with a strategy to approach with the best mix of those situations possible. Have in mind that Google is focusing on its users, not websites. You also need to focus on your target users. This year was significant for Google updates, and that rapidly brought changes in traffic for many sites. Mobile speed update which only affected sites that were already slow. Quality update focusing on E-A-T aka”Medic”. 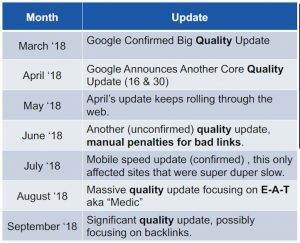 Quality update focusing on backlinks. For some of those sites, the impact of this was quite significant. Once you have combated with significant traffic loss, it’s time for SEO triage. The first step is to detect what caused that. It’s also helpful to create a timeline. 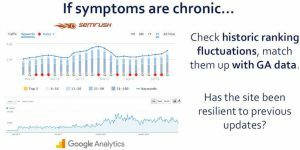 If the symptoms are chronic, check historic ranking fluctuations and match them up with GA data. It’s also helpful to see what’s being affected. Is it the whole site or only a few pages? You should also check to see if your competitors are affected as well. Further investigation can involve analyzing which queries lost clicks (or rankings). You can also use third-party devices such as SEMRush to check out your diagnosis. Make sure go through the URL inspection reporting in the new GSC to see if Google sees any problems there. 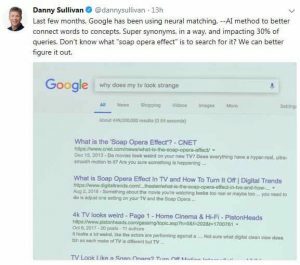 Go over to see if the SERPs themselves had some change. You should also check the index coverage report, and search for URLs that are indexed but not in the sitemap. Don’t forget to check your backlinks, as you may find problems there that impact the entire site. Use a crawler tool like Screaming Frog or DeepCrawl. 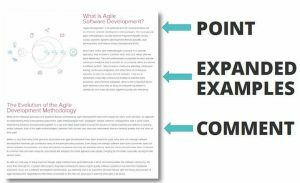 Find and fix all the issues you encounter there, and look for pages that are not being crawled by your crawler and make out the exact reason. With given information and updates, you should be able to detect and solve all problems that have affected your site. Always check for new updates and solutions that can help you manage your site correctly, without losing significant rankings.